Note: initial content copied from Wikipedia:Lion of Oz. Lion of Oz is a animated prequel film to The Wizard of Oz. It was made in the year 2000 by Lions Gate Films. It tells the story of how the Cowardly Lion, formerly part of the Omaha Circus, came to be in Oz and how he stopped the Wicked Witch of the East from getting the Flower of Oz. It is based upon the book Lion of Oz and the Badge of Courage by Roger S. Baum (great-grandson of L. Frank Baum, the original author of the Oz books). The Lion is a circus lion, displayed in a cage where everyone's afraid of him. His only friend is Oscar, the Circus Balloonist, who lets Lion out of his cage and takes him up on his balloon. While they're up there, Oscar gives Lion a Badge of Courage for coming up on his balloon, but they are soon caught in a storm, and unknowingly blown to the Land of Oz. Lion falls from the balloon and Oscar can't stop it from leaving and carrying him off. Lion comes across a living Oak Tree being harassed by Flying Monkeys. Lion frightens them off and the Tree thanks him, and Lion is surprised he can talk. The Tree explains the monkeys serve the Wicked Witch of the East, and speak of the devil, she shows up. The Witch is bent on conquering Oz, but is prevented from total control by something called the Flower of Oz. She threatens Lion to find it for her or he'll never see Oscar again as she says Oscar is her prisoner. Setting out, Lion comes across two fairies, whose friend Starburst, is trapped in a chest of emeralds at the bottom of a deep pond. Lion dives in, despite his aversion to water, to save her when the Witch's henchman Gloom, a living mist of misery, arrives and tries to tempt Lion into forgetting Starburst and taking as many of the emeralds as he wants, but he ignores him and saves the little fairy. The fairies gratefully point Lion in the right direction, telling him to go to a certain castle. As he nearly arrives, he comes across a springy teddy bear named Silly Oz-bul, who says he needs to cross the river to get a drink at the castle. Lion points out he can get a drink from the river, which Silly does. He follows Lion to the castle where they are confronted by a toy soldier named Captain Fitzgerald, who thinks they're enemies. but the misunderstanding is cleared when a young girl named Wimzik and her toy ballerina Caroline come along. Lion explains his mission and they decide to come along with him. Meanwhile, Gloom reports to the Witch that Lion interfered with his business, so the Witch confronts Lion again, and zaps Fitzgerald to her dungeon, threatening that for each day Lion doesn't find her the Flower of Oz, she'll hurt more of his friends. The Lion, with his party. Undeterred, the friends keep going, until they come to a waterfall. But they see a silver bridge to a floating island and Silly leaps out of the frying pan and into the fire when he tries to cross the bridge, but it turns out to be an illusion, and nearly falls over the cliff. Luckily Lion saves him. They then hear a voice from the bottom of the cliff telling them to go back, but when Lion announces they're looking for the Flower of Oz, they are invited down by the voice. They come to the town of the Mini-Munchkins, who built the Silver Bridge before it was destroyed by the Wicked Witch of the East and she punished them by making them smaller so they couldn't rebuild it. The bridge the group saw earlier was just an illusion caused by the Mini-Munchkins' sadness. But Wimzik inspires them to believe in themselves and not to give up, somehow breaking the Witch's spell over them, returning them to their real sizes and restoring the bridge. Inside the dungeon, Fitzgerald learns from a guard that the Witch never really kidnapped Oscar, and had merely tricked Lion into thinking so, and the toy soldier realizes he must escape and warn his friends. The group has crossed the bridge and as they go, Caroline's battery runs out, but Wimzik merely says she needs some sunlight to recharge it. But then the Witch returns, casting Caroline's unconscious body into a whirlpool. Lion dives in to save her but the current's too strong. Wimzik dives in and helps them to shore, whereupon Lion says somehow Wimzik's touch gave him strength and Caroline is fully charged from Wimzik's touch as well. The Witch leaves, promising that Silly's next. Back in the dungeon, Fitzgerald escapes and spies on the Witch while the group come across a strange cottage, where they are then confronted by the Seamstress, an elderly enchantress with powers over thread, hems, and patchworks, her wand is a large sewing needle. She turns Silly and Caroline into quilt patches but then her wand is knocked from her hand by Lion and her living Pin Cushion nails her sleeve to the wall. Realizing the Seamstress is under another of the Witch's spells, Wimzik manages to calmly talk the Seamstress into remembering how to laugh and smile, breaking the spell and revealing the Seamstress to be a nice old lady, and she turns Silly and Caroline back to their real selves. She then gives them a petal she says came from the Flower of Oz. Lion gets a whiff and tracks it to a large garden that's encased in ice. When Wimzik touches the flower, the garden is instantly thawed and Lion realizes that they've had the Flower of Oz all along: Wimzik. And the flower she unfroze is really her throne. The Witch attacks, bringing Gloom with her, as well as Fitzgerald, as he'd stowed along, and reveals the Witch doesn't have Oscar. Lion demands an explanation and the Witch reveals Oscar's balloon actually carried him to the distant Emerald City. The Witch then tries to destroy Wimzik, but with the combined efforts of Lion, Silly, Fitzgerald, and Caroline, she is thwarted and Wimzik seats herself on her throne (unintentionally), restoring her mystical powers as the Flower of Oz. The Witch then sends Gloom after Wimzik. He tries to absorb her, but she is too powerful and he is sent flying into the air (and most likely destroyed). Enraged, the Witch steals Lion's Badge of Courage and sends it to a retreating Gloom. Wizmik orders the Witch to leave, and the Witch swears vengeance before vanishing. Lion is distraught to have lost his badge, now thinking himself no more than a Cowardly Lion. Wimzik explains his courage and everything he's done weren't because of a badge but Lion's brave and noble heart. Despite this, Lion sadly bids his friends goodbye as he must go find his badge and Oscar, but promises to come back someday. 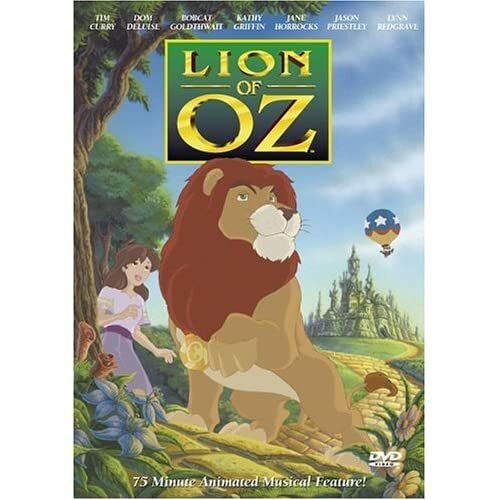 Lion eventually comes across a yellow brick road and meets none other than Dorothy Gale, the Scarecrow, the Tin Woodman, and Toto, and the story of "The Wizard of Oz" continues with his part in it, ending the story of the Lion of Oz. The film was released onto Region 1 DVD in 2000 with special features on the disc including Sing Alongs, Music Videos (which were straight from the movie), Games, Interviews with Behind the Scenes and a Gallery. The film was later released onto Region 2 DVD in 2002 but had no special features and only a scene selection on the DVD menu. Jason Priestley as Lion, the main protagonist of the story. He is not cowardly like in the movie The Wizard of Oz, but is brave instead (believing his bravery comes from a medal that Oscar gave him). Jane Horrocks as Wimzik, the second protagonist. She joins the group for a chance at adventure. It is later revealed that she is the Flower of Oz. Bobcat Goldthwait as Silly Oz-Bul, a strange teddy-bear-like creature with springs. He is very clutzy, giving him the often said saying "Silly me!" Kathy Griffin as Caroline, one of Wimzik's toys. She is a wooden, long limbed doll. Tim Curry as Captain Fitzgerald, another one of Wimzik's toys. He is a wooden soldier who likes to shoot pebbles at enemies. He is very protective of Wimzik. Lynn Redgrave as The Wicked Witch of the East, the main antagonist. She forces Lion to find the Flower of Oz. They defeat her, however, and she is forced to retreat. Scott McNeil as Gloom, the secondary antagonist, he is a living smoke spirit and the witch's partner. He is sent flying away (or most likely killed) at the end of the movie when he attempts to capture Wimzik. Dom DeLuise as Oscar Zoroaster Phadrig Isaac Norman Henkle Emmanuel Ambrose Diggs, Lion's friend and tamer who pilots a hot air balloon. The Witch tricks Lion in to believing she has Oscar her prisoner, but this is a fib. It is revealed at the climax that he landed in Emerald City, implying that he is in fact the Wizard. Maxine Miller as Seamstress, a old lady that is put under a spell by the Witch. Don Brown as Pin Cushion, the Seamstress' talking pin cushion. Gerard Plunkett as The Oak Tree, the first being Lion meets in Oz. Mik Perius as Sunbeam, the only male fairy Lion meets. Eleanor Noble as Moonbeam, another fairy Lion meets. Elizabeth Robertson as Starburst, a fairy Lion rescues from Gloom.